Also, I rode the subway with a dog this morning but I didn't even realize it until I looked down and saw that there was a dog and realized it was a dog. Also, do dogs have homes? Is this realistic? It looks like yet another True Soda stooge. I'm detecting a trend here. Yes I know the parenthesis were redundant. I know order of operations like Gamzu knows swimming! The headline clearly says "Soda Claus," not "Santa Claus" or even "Santa Clause," which was a hilarious Tim Allen movie wherein he plays Santa Claus due to a clause (get it?!?!) in a contract. Moochoo you and that subway were very lucky. I myself enjoy the meatball sub. Others prefer Italian. I say they are racist. I guess I never realized that about the Tim Allen movie. I think that is why True American Dog is such a great site. I learn something almost every day. I wonder if people would like a "Halloween Clause" movie where Tim Allen is followed home by a vampire who is available for hire for entertainment purposes. As for those of you who are always disrespecting True Soda, look at the motto at the top of old "can head". Merry soda to all! May 1,000 vampire perform at your bar mitzvah and follow each of your guests home. 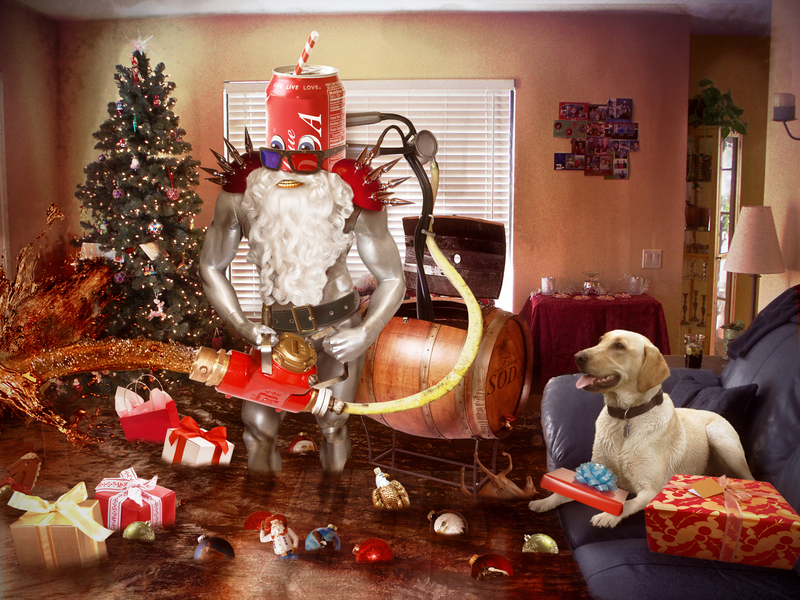 That's not the real Soda Claus. He has a fake straw. Meve: just 'cause my statement was "That's not Santa Clause" doesn't mean I didn't read the title carefully. If I were an Internet Detective I would be inclined to say "The game(zu) is afoot!" at this point. I am in a part of the world where it is impossible to celebrate Christmas and many of the other popular Winter holidays, but I wish you all Happy Holidays nonetheless. Enjoy your fried Tuna and poached albatross or whatever it is that people still celebrate with. I have abs of steel too but, I'm a lot more special than fake santa with a soda breathing gun!!!! Informal Poll: Which is better, Dogs or Cats? Sorry my href didn't work on the last posy and I know Gamzu would come down heavy on me. ULTIMATE FAN BLOOD ORANGES HOLIDAY CITRUS SPECTACULAR!!!! A percentage of proceeds will be donated to whatever charity you are thinking about when you purchase + you do not need to include a shipping address! Here is your Christmas card. It is all you are getting from me. Vampire Rick? More like Macaulay Culkin as Richie Rich...always trying way to hard to impress the other kids. So what it's it "Rich" do you or don't you have a McDonalds in your house? Hey I am just a big admirer of your talent of photo editing simply..It just makes me smile big big bigger every time...just love the concept of Soda Claus in Christmas season...Great Fun!! Really a fun advertise to promote the soda...the editing was done perfectly to make someone smile more bigger indeed!